So perfectly executed was the mission to rescue Capt. Scott O'Grady that it amazed even the men responsible. Just five hours after radio contact was first made with Basher 52 - O'Grady's call sign the Air Force captain was safely on board the USS Kearsarge. The downed F-16 fighter pilot's rescue from a Bosnian mountainside by Col. Martin Berndt's 24th Marine Expeditionary Unit electrified the nation in June 1995 and renewed many Americans' faith in the military. This book tells the story of the mission in the words of the men who commanded, planned, and carried it out. To get the inside account, Mary Pat Kelly travelled throughout Europe to conduct more than one hundred interviews, visiting U.S. ships and bases and UN posts in Croatia and Bosnia where participants were stationed. 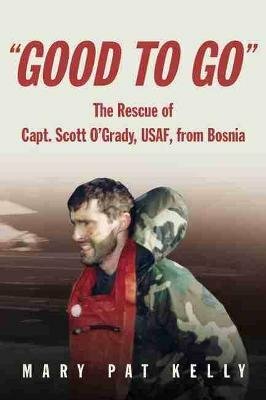 Admiral Leighton W. Smith Jr., commander in chief of U.S. naval forces in Europe and head of NATO forces in the Southern European theatre, provides the framework with his day-to-day commentary on the efforts to find Captain O'Grady and a nearly minute-by-minute record of the rescue itself. In concert with Lt. Gen. Michael E. Ryan, commander of U.S. and NATO air forces, the admiral reveals the decision-making process that led to the ""Good to Go"" order. Readers then hear from the Tactical Recovery of Aircraft and Personnel (TRAP) team; the Navy and Marine Corps commanders, pilots, crew chiefs, and grunts who made it happen. Speaking for the Navy are Capt. Christopher Cole, skipper of the Kearsarge, Commo. Jerome Schill, and their staffs, from the intelligence officers to the grapes who fuelled the aircraft. Captain O'Grady puts his own experiences in the context of overall events.